Share & Care helps poor children in Sri Lanka and other countries. We help British schools by buying unwanted computers (Other wise they have to pay to dispose them) and distribute them among children in Sri Lanka and other countries. 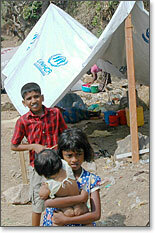 We also help war affected children and war widows from both side of the past conflict in Sri Lanka. Organisation was set up in January 2005 by Sri Lankans and sympathisers in the UK, initially, to provide ongoing support and relief for communities in Sri Lanka affected by the 26 December 2004 tsunami. Share & Care is a UK-based registered non-profit organisation. We channel your support directly to individuals and communities and report on what is being achieved. Share & Care is organising a dinner dance on 21st of September 2013 to raise funds to help poorest kids in Sri Lanka, particularly Hiruni Vishvalanka, who lives with her grandmother in a corrugated hut by the side of village cemetery. We have sent computers and other donations to Sri Lanka. As well as read the Keith Notely's Visit to Sri Lanka. Jan and Keith Notely is one of our sponsors who sponsor 2 children and pay half of another child's expense. On Sunday 20th August, 2006, Ajith, Neil, Asha, Sandali and Navin helped Share & Care by participating in a car boot sale in Milton Keynes to raise money for the charity. We organised a dinner dance event in London to raise Share & Care's profile and to raise funds to support tsunami victims. It was held o n Sunday 11th September, 2005, at Masti Restaurant, a popular venue in Wembley. Highlights of the evening were the presentations on Share & Care's work, the raffle draw and the auction of a cricket bat signed by Sri Lanka's national cricket team. We would like to thank all our guests for supporting our cause. We hope you enjoyed the evening. On April 5th, Share & Care sponsored a counselling programme for 240 children in Matara, who were made homeless by the tsunami disaster and are still living in tent camps. The event was a success and has brought the smiles back to the children's faces. On Sunday 6 February 2005, a team from Surrey Fire & Rescue Service and their families took part in a sponsored walk in London to raise funds for the tsunami appeal.